Google, Samsung, Acer, HP, Ausus, Toshiba, Lenovo all have released or will release their own Chromebook laptops. A Chromebook is a laptop running Chrome OS as its operating system. The devices are designed to be used primarily while connected to the Internet, with most applications and data residing "in the cloud". By connecting to the Google Drive, Chromebook allows you to store all of your videos, music and pictures. However, currently Chrome OS doesn't support the video codecs for Blu-ray Discs. If you wanna play Blu-ray on Chromebook, the easy and possible way is to convert Blu-ray to Chromebook compatible video files. To rip Blu-ray to Chromebook easily and quickly, EaseFab Blu-ray Ripper is highly recommended. With it, you can convert Blu-ray to Chromebook friendly video formats with fast speed and excellent output quality. It will help you easily remove various Blu-ray protections including BD+, AACS, and other DRM protections. If you're a Mac user, you can turn to EaseFab Blu-ray Ripper for Mac (Yosemite included), which has the same function as the Windows version. Just download the right program and follow the easy steps to complete the whole conversion in just a few clicks. Converting Blu-ray to Chromebook compatible video files with EaseFab Blu-ray Ripper is simple as ABC. After downloading, follow the wizard to install and run the program. Then follow the steps below to rip Blu-ray to Chromebook playable videos in a few clicks! The below guide takes Blu-ray Ripper for Windows (Windows 8/8.1/10 compatible) screenshots for example. Insert the Blu-ray disc to the Blu-ray Disc drive (or DVD to the DVD-ROM) and click the "Load Disc" button to have movies uploaded to the program. Here you can also import DVD folders, ISO files and IFO files to convert. If you want to rip Blu-ray with subtitles, please select the subtitle and audio track from the corresponding drop-down lists. 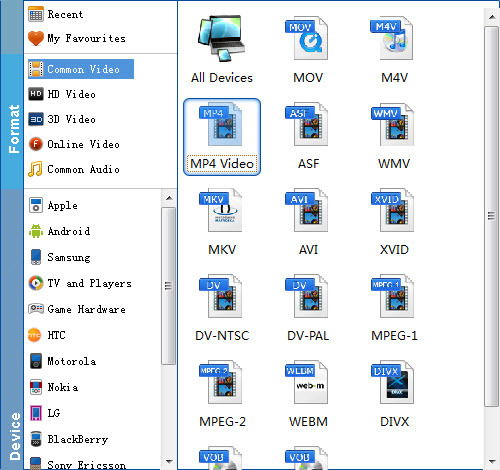 Then click "Profile" and select MP4 as the output format from "Common Video" category. Tip: If you're not satisfied with the result videos. You can click the Settings button beside Profile to set bitrate, frame rate, codec, channels, sample rate, etc to adjust parameters that affect video quality and file size for the video you prefer. Please remember the file size is based more on bitrate than resolution which means bitrate higher results in bigger file size, and lower visible quality loss. Generally speaking, for watching movies on Chromebook, 1080p with 2500~4000kbps is all right. After all the necessary settings, hit on the big "Convert" icon and start Blu-ray movie to Chromebook MP4 conversion. When the conversion completes, you could find the generated MP4 file by click "Open" button. First plug the USB stick to your Chromebook. By default, Chromebook uses the built-in media player to play audio and video files. Just simply double-click the target video file in Files app and now you can enjoy Blu-ray videos on Chromebook offline!